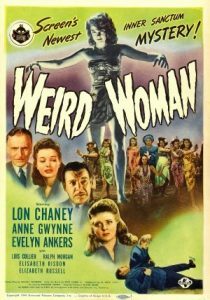 Weird Woman – When a college professor whose life work is the battle against superstition marries a beautiful woman with a voodoo background, the return to the university leads to bitterness, fighting, and murder. Is it due to voodoo — or something more mundane? Part of the Inner Sanctum series of movies, Weird Woman stars Lon Chaney Jr. as the handsome college professor. He not only marries the beautiful Anne Gwynne while off doing research, but has written a best-selling book. His return to his university causes stress with scream queen Evelyn Ankers. She had expected the professor to marry her instead. Another professor is pushed by his wife to write his own book. The goal is to support his push for the chairmanship of the department. A young collegiate is hired by the professor as an assistant, leading to her boyfriend becoming jealous. If this sounds like a soap opera, that’s because it is. Mixed into this is the newlywed wife doing a voodoo ritual to protect her husband … But he has her destroy it, at which point all the bad things start happening. The question of is it supernatural, or purely natural, is the underlying stress of the movie. The villain of the movie frankly makes me think of Shakespeare’s Iago, where she doesn’t directly do anything. But a slight suggestion here, a minor lie there, and suicide and murder follow. The acting is good all around, and Weird Woman is an enjoyable movie, that ends more like an episode of Scooby Doo. Professor Millard Sawtelle (Ralph Morgan) – the professor who seeks the chairmanship of the department, and feels threatened by Reed. June 29, 2017 admin Horror movies Anne Gwynne, Evelyn Ankers, on Chaney Jr.